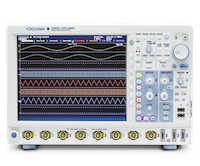 The DLM4000 is a unique to the industry 8 channel mixed signal oscilloscope suitable to test and debugging applications in the embedded systems, power electronics, mechatronics, and automotive sectors. Available in both 350 MHz and 500 MHz models, the 2.5 GSa/sec DLM4000 features 8 analog input channels. The 8 input channel features Flex MSO which converts to a 8-bit logic analyzer at the push of a button; add 16 additional logic analyzer inputs as an option, for 24-bit logic analysis. Advanced measurement and analysis features such as power analysis and serial-bus analysis, digital filtering, user-defined math, and super-long record lengths (up to 125 Mega Points) make the DLM4000 a super powerful engineering tool. High-resolution 12.1-inch LCD display, compact landscape format, ergonomic and friendly user-interface make it easy to use.